Long time, no food pic/post, so here goes. It’s been absolute ages since I snapped and posted a picture of something I’ve cooked in my kitchen. In fact, its been forever since I shared a food picture on Instagram at all. And so yesterday, when I took this picture and shared it with S & S – because the curry looked so pretty – it got me thinking. I killed the fb page for hungry and excited about six months ago for various reasons, which I have written down in an unpublished draft. I’ve turned down the last few cake orders I got with the excuse that my life has taken over and I no longer have the time or the inclination to bake. That excuse is true because until last weekend, I hadn’t turned my oven on since the strawberry cake marathon ended. About a month ago, the hungry and excited domain died and I got a reminder to renew it. Four weeks since, I’m still not sure if I’m going to, or if I do, what form it will take. The blog is dead, for everyone who has written in to ask why, and when it will be up – from gentle emails to pressing, desperate whatsapp questions – I really have no definite answer. I don’t know when I am going to resurrect it, and when I do, I know I want it to go back to what my blog originally used to be, so I want to be able to create a space for it. I’m increasingly growing tired of the food feeds across all the social media platforms and at first I had mixed feelings of nostalgia and angst about by this was happening to me. Now I no longer find myself wondering. I know why this has happened to me. My interests have changed. However I still cook. Daily mundane meals. Inspired weekend meals. And everything in between. But some days inspiration strikes in the middle of the week. Like a cloud over my head that refuses to lift until I have give in, poked it and allowed myself to be consumed in the down pour. It means I don’t wait for the weekend. I brush work aside and rush to the kitchen to cook. In an older life, inspiration drove me to do crazy things – like beginning my morning by baking 200 cupcakes, like convincing myself that I needed fresh home baked bread every time I ate pasta, like the days I would cook and deliver fresh lunch to the hugsband every single day. People who knew me said I was crazy. And yet, all those things I did, they felt completely normal. To me. Back then. Yes, inspiration can make you do crazy things. And today looking back, I do think I was crazy. Back then. Because I no longer recognise that girl. But, I still cook. Mundane everyday meals, inspired weekend meals. Everything in between. Sometimes inspiration can make you do crazy things. And sometimes it can make you get up and go make lunch. Well, what can I say. When more than three people write in to a) ask where you’ve disappeared to again b) remind you about a post you casually promised to finish and post and c) request you to please blog on either on of your blogs (yeah, talk about pressure!) it’s only a matter of time before you decide to give into the muddle of things you want to say, and resort to a list. Here’s what’s new. And some news. 1) A haircut. After over a year of semi-short hair, managing curls, cursing bloody product, and reaching the point of needing a trim a little too often, I decided to bite the bullet. I’d been thinking about this for over two years now, and the original short haircut was meant to be a buzz, with the hugsband’s electric trimmer. I’m glad I didn’t do anything that drastic, because I now know how fast my hair grows, and maintaining that would have been a bigger nightmare than I was looking to deal with. At every point that I would go in for a trim I’d request a shorter crop, only to be told my face is too small, or too long, or that it was too drastic a change, and I’d be asked if I was realllllly, realllllly sure. Apparently, just asking for it is not enough. So finally, last month I decided enough was enough and that I had nothing to lose, but the few inches of hair I was going to chop off. And that was pretty much all there was to it. Anti-climactic end after the climax that was all the over-thinking, over-cautioning and over-dramatising. It’s short now. So short that on day 1, the help walked in, looked at me, began to giggle and didn’t stop, pausing momentarily only to tell me, “Didi, peeche se to aap mard jaise lag rahe ho.” Okay, then. So yes, its boy-short. Pixie-short. Don’t-need-a-comb short. Wash-it-everyday short. Roll-out-of-bed-and-nobody-would-know short. I-love-it short. 2) The sister says I look like a lost farmer child in the picture above. She’s close, actually. VC snapped it when I was gardening. An activity that still makes me feel lost and at-sea. And yet, yet, yet, there’s a garden growing in my home, yougaaiis! For a whole year after we moved in here, I let the yard grow weedy, overgrown with so much rubbish, until one fine day I could take it no more. 4 snakes sighted around our colony over the span of a week might have had something to do with the sudden urgency with which I had it cleaned out. I have an abysmal track-record with growing plants. Essentially, anything I touch, dies. So in order to improve my chances with keeping a garden, I decided to get professional help. I hired a gardener who now comes in once a week to oversee all the major stuff. I’m not on my own, he makes sure I’m treating my plants well, and that they’re not being suffocated by my over-anxious over-watering. It’s been a little over a month and my Sundays now begin with an hour of pottering about the garden, messing around in the mud, rearranging stuff and generally feeling chuffed and fascinated at how stuff grows. It’s quite thrilling to watch buds bloom overnight, tiny curled up tightly-rolled leaves unfurl and take shape, tendrils clinging on to the closest support and climbing high, seeds sprouting and pushing their baby heads out of the soil. My entrance now sports a profusion of several kinds of Petunias that are seriously growing like they’re running out of time. There’s also a couple of pots of Impatience (called so, because they’re so impatient to grow). And I have to admit, the front of the house is transformed. I took the friendly advice of some seasoned kitchen-gardeners, bought some good quality potting mix from the closest nursery and “scattered a few seeds from my masala dabba.” Seriously. That’s all it took. I had a pot of methi that burst to life in just a few days. I actually looked at the pot, tiny green shoots pushing their way out of the soil, and went “aww.” Little baby stalks of methi, fighting to come out and breathe, with bits of mud atop their heads. Totally adorable. And no you’re not the only one who thinks this is abnormal behaviour. A told me to stop stalking them, because it’s not like they’re going to grow up and go away to college. My over-enthusiasm to “nurture” them might have gone a little wrong, and some over-watering might have occurred. So I had to “harvest” the methi prematurely today. Young, wee tender leaves and stalks got cooked into a channa-methi dal, as suggested by someone who saw the picture on facebook. Totally yummy, and I suspect psychologically yummier still, because you know, garden-to-plate and all that hipster jazz. I’m not writing off my slowly-turning-green-thumb yet. So I also potted a fresh batch of methi again today, determined to get it right. There’s a pot of garlic shoots that is growing out of control. I regularly snip the shoots and add them to tadkas, salads, etc. They taste like a sharp variety of chives and make for an excellent addition to pretty much anything. Here it is, on cheesy scrambled eggs last Sunday. 3) The Hungry & Excited website. Yes, its new. Again. Go see! Still polishing it, tying up loose ends and figuring it out as I go. But it’s up and working, now if only I could get my email subscriptions to work seamlessly, we’d be set. But the up-side of having the blog running again is that I have no more excuses. I kicked the lazy out of me this morning and posted a 7-month old draft. Yes, I’ve been that lazy this year. I made these rolls in April, when it was hot, hot, hot. Perfect weather to make bread. But right now, is perfect weather to eat make meals of soup. And you know what goes with soup, right? 4) This new little gadget is currently making VC’s world go round. It’s being used with alarming regularity. 5) There’s been a healthy amount of new work too. Woke up on Saturday morning to tweets and facebook posts pimping my first Mint Lounge piece. A piece I really enjoyed working on. Hopefully this will be the first of many more to come. Then there’s some work scheduled to come up on the much-talked-about and much-anticipated Huffington Post India. I’ll update when I have more details. And if you’re in Goa next week, I’m going to be speaking on a panel on food blogging at the Goa Arts and Literatary Festival 2014. Again, I don’t have complete details. I know there’s going to be Pamela Timms, Rushina Munshaw Ghildiyal, Helene d’Souza, Karen Anand and Aparna Jain (of The Sood Family Cookbook fame). When I have more details, I’ll update them. 6) Also new, after a few gloomy weeks of feeling a bit lost and wondering where I am headed, is a new-found, burst of energy, and more importantly focus. To make things happen rather than contemplate them endlessly. To cut back the faff and focus on what matters. To count the joys, celebrate them, no matter how big or small, and treat the hiccups as they should be treated — hold your breath, count to 40, breathe out and move on. A couple of weeks ago, I was at the lowest I’ve felt in way too long. I was blue and moping over something or the other seemed to become an everyday thing. And suddenly I had this day. Ironically, the bluest-skies-of-all-time kind of day. Just like that, out of the blue. One of those days where everything went really well without anything special happening. There was good company, reminders of love and friendship, two fabulous surprise homecooked meals, great conversation, a kindred spirit, a good few hours of work on a fun assignment, one of the harder workouts I’ve had in a long while, a big fat endorphin rush. And these crazy skies were the cherry on the top. It felt good to just be happy, for everything the way it was. That good old, my-cup-runneth-over type feeling has returned. Okay, back to work before some troll accuses me of having too much fun in life. Hungry & Excited has been on an unplanned but severely stretched hiatus for way longer than I care to admit. I’ve gone on unintentional, long breaks before, but none so long, and none that have left me with close to no inclination to go back and blog. Even more ironic is that this feeling swept over me like a tidal wave, close on the heels of the Indian Food Bloggers Meet. And yet, I haven’t been able to put a finger on it. This time around, I have just gone with the flow, instead of fighting it or trying too hard to pull myself out of this lull. It’s not even like I haven’t been inspired to cook. I’ve been cooking as usual, enthusiastically, even. And I have been trying new things, making dessert, having people over etc. But cooking for the blog, pulling out the dusty camera, shooting the cooking, processing pictures, writing posts and publishing them seems like a distant dream. More so when I know I have a pile of unpublished drafts in various stages of glorious, incomplete, imperfection. With about as much inclination to get down to it, as a hibernating bear that was rudely ask to wake up mid-winter, things have been woefully quiet on the food blog. It could also be the fact that the hugsband and I went on a mission to overhaul it again. A mission that began in July and was supposed to last 2 weeks, but went on for 4 months. And even now, though its live, is still terribly incomplete. There are upper-case-lower-case issues to sort out, featured images to be painfully added to every post, page titles to be finalised, incomplete drafts to be pruned and published, etc etc etc. To add to it all, I’m feeling bone lazy. A little laziness towards blogging has changed to full-blown inertia and the inability to move. But the one thing that hasn’t stopped is the videos. In fact the hugsband has been very proactive on weekends, egging me on to make this and that, planning video-worthy things to cook and coaxing me to prep so he can make the most of his free time on Sundays. And it’s how we’ve managed to churn out quite a few videos in the last few months of silence. The words might be on a break, and the recipes are slow to come, but the food hasn’t stopped and the documentation just got better, and a lot more fun. Video might very well have nearly killed the foodblogger in me. And believe me, with the kind of stuff I see going around in this space, I’m happy to be a little inactive. Detaching myself has inadvertently turned up the fun quotient, like it always does when we stop getting so serious about what we do, lighten up and remind ourselves why we started blogging abut food to begin with — because its fun, and its easy to share it. On that note, I’m sharing two videos VC made recently, which somehow I have forgotten to post here! First, this really simple eggless, yellow cake that uses custard mix out a box, rather than the one-too-many egg yolks that usually contributes to this classic cake’s yellowness. Be warned, it is seriously buttery, but really yummy. Best had warm, straight out of the oven and polished off within a few hours of making it. And then, these classic Goan mince meat cutlets. The recipe is an adaptation, but its very similar in flavour to the legendary beef croquettes that are synonymous with Goan 7 pm hunger pangs. I used beef mince for the making of the video, but have used chicken in the past with success. My sister has used mutton mince and said it was really tasty, so I imagine it would work with any strong meat which can be bound together with the potato and egg that goes into it. Fish/crab might be a bit of a stretch. Either way its the perfect snack for a couple of cold beers. Or can also be turned into a meal with bread/burger buns and some veggies to go with it. Yesterday we finished shooting an utterly simple, but flavourful chicken pulao I learned from my mother in law when they visited us in September and I can’t wait to share it with you guys. In the mean time do me a favour and don’t step over to the food blog, it needs a lot of fixing, and I’m on it. Bear with me as I try and battle the inertia and update things and pretty it up. Stay with me on facebook until then, its where the updates tend to flow, albeit much less frequently these days. Maybe saying video killed the blogger in me, is a stretch. I don’t think I can give up blogging any time soon, I don’t even think I can say I no longer want to write a conventional recipe post. But this change has been good for me. And when this sort of change brings out a previously unexplored idea, it can only be a welcome one, no? What’s the one thing you would never give up eating? someone asked me early this week. I was stumped. It’s not one of those things answers I have prepped and ready at the top of my mind, just waiting to tumble out if I press play. I serioulsy couldn’t think of a thing. I thought some more, thirty seconds later I still didn’t have an answer. Absolutely nothing, I eventually said. I love food too much to think of giving any part of it up. I thought about it later, though. I’ve never needed to give up anything. Haven’t had any weird allergies thankfully, haven’t gone on a diet and never thought about wanting to quit something I love. And then it came to me — I recalled I’ve done some insane things in the past, like given up rice for month, chicken for even longer, sugar for a bit (though this one didn’t last long at all). This was all within the first year that I got married. I’m putting it down to some form of rebellion, and stubbornness to prove I could do things that weren’t done. But I am just not strong-willed enough about food anymore. I think a lot of it has to do with a sudden increased awareness of what’s good and what’s bad for me. With many inherent bad food habits having weeded themselves out of my life, I’ve willingly turned toward a practice in moderation. I enjoy all kinds of food. I love a well cooked pork-belly as much as a simple meal of daal and rice. My eyes light up when I see a bowl of plain homemade lightly-spiced sabji, as much as it would if I saw an exquisite dessert. I’m adventurous and love to experiment with ingredients, cuisines, meats, style of cooking, as much as I am a curd-rice maami at heart. Both extremes can some times elicit the same levels of satisfaction in me. So for the last few years, I’ve just made my peace with eating what I want, as long as it is in moderation. And even when I trip up on the moderation, which happens more often than I am willing to keep track of, I know it is okay. It is really not the end of the world. So I thought about it some more. What’s the one thing I would absolutely never give up? I would die without carbs, I think. I cannot imagine a life without rice, pasta, bread, potatoes and everything else that puts the full into fulfilling meals. A majority of my instagram feed is a carb-fest and the I-must-blog-this mental list I maintain is growing out of control. The Hungry & Excited blog is undergoing an overhaul that’s taking much longer than anticipated. Only because VC and I have slacked off totally in sitting our bums down, putting our heads together and finishing it off. I outsourced the job because I thought it would be faster for a professional to do it, than teach myself CSS. But turns out I didn’t account for our own busy lives and our inability to coordinate simple work meetings between ourselves. But many of the the recent instagram pics have received the much-loved Recipe, please? and Blogging this? responses. I’ve decided I cannot wait any longer, so I’m going to share a few quickie recipes here. Since I’m tucking away a bowl of veggie pulao, with aloo sabji and salad right now, and I have a sinful orange infused, chocolate chunk-studded bread pudding waiting for dessert, I’m thinking why should I have all the carb fun? Easy Anda Biryani — I made this for the sister who had a few friends visiting her when she was in Goa last month, and apparently they couldn’t talking about the meal for the rest of the day. I’m definitely going to be making it again. 1) Cook the rice separately. I used a rice cooker with 1 tbsp ghee, 2-3 cardamom pods, 1 bay leaf and a stick of cinnamon, with 4 cups water. Basmati works best. But you can cook the rice the way you normally would, just ensure that the grains retain their shape and texture, and the rice isn’t mushy. 2) Set the eggs in a pot of water to boil. Set aside. 3) Warm some oil/ghee (i usually use a 50-50 ratio), throw in the khada masala, toss till it all gets aromatic. 4) Add in the onions, ginger and garlic and keep tossing till they begin to brown evenly, then add in 2 slit green chillies.5) Tip in the tomatoes and add salt and cook the whole thing down to a mush. Add masala powders in quick succession. A little of each goes a long way. Cook, cook cook till everything smells divine and turns to a glossy mush.6) Add chopped coriander leaves mixed with mint leaves, toss some more. 7) Tip in the coconut milk along with a little water till curry reaches the thickness/thinness you desire. Cover and let it bubble. 8) When the curry is cooked through, add a generous sprinkling of Everest Egg Curry Masala (or any other multi-purpose masala of your choice — Meat Masala or Kitchen King or even garam masala). Mix well cook for a couple of minutes and turn off. 9) Halve boiled eggs and place face up, drench them with gravy and sprinkle coriander and let it sit for a while. 10) Once the rice is done, take a large, heavy-bottomed pot, grease it and begin layering the rice and gravy. Start with a generous layer of rice, and alternate with the egg curry, keep going till it all runs out. You could just serve it this way, but I prefer to cook it on the dum for a bit (refer link to see how I’ve done it before). 11) To cook it on the dum, I place my cast iron dosa tava (its really thick) on a low flame, and this thick bottomed pot on top of it, closed with a lid and i let it steam for 15-20 mins. Dinner Toasties — made these on a rainy night when I was too lazy to cook and we didn’t want to order in. I had some odds and ends in the fridge, so I just threw it together without thinking too much. It was delicious, filling and a good meeting point between mini pizzas and grilled toasts! I simply pre-heated the oven, lined a baking tray with aluminion foil and placed the sliced bread on it. Then I began making the topping, for which I sautéed some onions, garlic, mushrooms, bell peppers (which is what I had in my fridge. In the past I’ve used baby corn, cherry tomatoes, basil). Then I added in a spoon of chilli-garlic sauce (I use the Fabindia stuff), added in some chopped spinach and corn kernels. Cooked the whole thing down till the spinach had wilted, and all the water had dried out. Next, I spooned it equally on the sliced bread, grated cheese over it and popped it into the oven for 12-14 mins till the cheese was melted and the toast was crisp. Quickie Shahi Tukda — I made this early on this week because I really wanted a warm dessert to perk my spirits. I was stuck in the middle of an allergy attack, and two days of sneezing my lungs out had left me low on energy and with no will to do anything. I also had a loaf of terrible bread that I couldn’t bear to eat as bread, and less than a 1/4 tin of condensed milk in my fridge. It seemed like Shahi Tukda wanted me to make it, rather than the other way round. 1 used a little under 2 cups of milk with the malai in it. Whisked it all together and set it on the stove, on a low flame. Stirring it at regular intervals I let it simmer for almost 15-20 minutes till it had reduced considerably. I added the condensed milk (about 4-5 tablespoons) and stirred it together, leaving it to simmer for 10 mins more. At this point, you should taste it and adjust sugar by adding more, if needed. You can also add kesar or elaichi to the milk but I didnt feel like either. When it had reduced still more (you’re looking for a creamy, slightly thick — not runny — milky mix), I set it to cool. Meanwhile I chopped about 6-7 slices of bread in half, dabbed them very lightly with ghee and toasted them in the tava till golden and crunchy. I arranged them in a shallow bowl (or deepish pan). When the milk had cooled slightly, I poured it all over, pressing the slices slightly. I sprinkled it with roasted sliced almonds covered it and let it rest for 2 hours. You can also chill it, but I wanted to consume it soon after, while still warm, so I let it be. it might seem like a lot of milk, and the bread swimming in it, but the longer it stays, the more the bread soaks in the milk and turns into a delectably creamy mush, so don’t worry. Refrigerate it after a while, though, if you don’t plan to eat it all up like I did. Orange-infused, Chocolate-chunk Bread Pudding — Soon after I made the Shahi Tukda, I saw this post and regretted finishing up the bread I had in my fridge. But I quickly remedied it by buying a loaf of bread (and I never buy them in such quick succession) and decided I would wait for it to get slightly stale, in time to make this pudding for a weekend treat. It didn’t work. I couldn’t wait. So I made it this afternoon, as dessert for the husband returning from a work trip. I eyeballed the ingredients and just threw it all in. Usually bread puddings bake to a complete mush, but the good thing I did was to cut the sliced bread into triangles and point the corners upwards, because while the centre of the pudding has turned warm and wonderfully creamy, the tops have remained crisp (but not crunchy) which gives a nice texture. 1) Toast 7-8 slices of bread, and butter them very lightly buttered. Chopped them into triangles and arrange them in a bowl, with the corners pointed up. 2) Zest a whole orange in a mixing bowl, add to it 5-6 tbsp sugar and whisk dry to release the oils. Add in 2 eggs and whisk it up till frothy. Gently pour in 400 ml warm milk, whisking slowly as you go. Add in a splash of orange juice and a generous glug of Rum and mix gently. 3) Pour the mix over the sliced bread. Roughly chop about 1/4 cup of chocolate chunks (I lazily hacked a slab of Morde) and add them on top. I took the trouble to squeeze a few chunksin between the layers of bread. 4) Pop it in the oven for 20-25 mins (170 deg C)till the custard bakes and the pudding jiggles slightly when shaken! Bread puddings are incredibly forgiving, and just so easy and quick to put together. They’re also very, very improv-friendly which means you can spike it with just about any special ingredient your heart desires. I am now tempted to make a chai masala-flavoured one! The husband came home from the airport for barely 5 minutes, before he was whisked again to meet a waiting client. The meeting continues over dinner. I can’t complain, really because it just means more pulao, more dessert, more carbs for me. So I’m stuck in the middle, in many ways. Work is on an extended limbo-like phase. I’m pursuing an opportunity that requires me to hold off on everything else I had going on. I’m waiting, and yet said opportunity is taking longer than anticipated to materialise. I’m 100% sure that if I drop it and accept the other smaller assignments in the waiting, I will immediately hear from the bigger one I was originally waiting on and then feel like a fool. So I continue to wait, and its really getting annoying to be stuck in the middle with no real idea of which direction to move in. My routine is still floundering around in a state of disarray. Life has resumed in earnest, but functioning without that set routine back to the way things were is not easy. I need routine, it rules me. I let August go as my month off from normal life because I had so much happening, and ever since the maid-spat early this month, I have hired new help. cheerful, sweet and hardworking girl who has also agreed to help me out in the kitchen. This is way more than I could ask for at this point because maybe I can finally free up some time and stop cribbing about never having enough of it. But on the downside, she is engaged till mid-day and comes to my home at 11. This new schedule is taking longer than I expected to get used to. I am used to having my house back in order before I go off to the gym in the morning, a routine that sets the rest of my day rolling. Now everything feels like its pushed back by two hours because the clean up only begins at noon. We’re both doing our bit to work around it, and deal with everything shifting by a couple of hours, which some times means the dishes lie undone till noon (which drives me slightly batty), and lunch happens later than usual (which just makes me ravenous) and then afternoon spills over into evening — basically a new routine. But when you’re a creature of habit like I am, the smallest change makes you feel like you’re stuck in the middle. I really ought to pick up and get going, but everyday I feel like I’m going against the grain and not really moving ahead. The Hungry & Excited website is being revamped as we speak. It was meant to be a 15 day project, but its taken more than 2 months. This is partly my doing, I got so busy with IFBM that I didn’t follow up as closely as I should have. And then I’ve been a bit scatter-brained about picking up and closing the loop. It’s almost done, and I’m happy with the way its turned out. THe minute it’s up and we’re set to go, I want to introduce two new cakes on the menu and start doing some small-scale local advertising. I’m exciting to hit play again, but I can’t do it until my website is actually fully ready and running. It also means I have to hold off on posting new posts, sharing anything else on the blog and generally moving on with normal programming. The wait is killing me. This neither-here-nor-there situation is really like being stuck in the middle of nowhere. I’ve hit a roadblock as far as cooking goes. I’m constantly itching to eat something different and don’t always have the energy to whip it up myself. I find reasons to cop out of cooking a lot, or willingly let VC take over, or just be really bad and order in — and this is not normal in these parts. I feel like I’m not able to slip back to normal life, and it’s really beginning to annoy the crap out of me!Unable to move forward or backwards. Just stuck. Here in the middle, is where I am off late. It hasn’t helped that my home has been full ever since I came back form Bangalore at the start of August. I have underestimated the wonder that is having my own personal space. I love having people over, so I never imagined that 1.5 months of it would have stuck in the middle, not able to hit the pedal and get going with my life the way I know it.So I’m mostly just going with the flow. Doing things as I feel like, not planning my days too much and not thinking about it. I’m reading two cookbooks at once — if that qualifies as reading. Aparna Jain’s The Sood Family Cookbook has me wanting to bookmark every single recipe. Rushina Gildiyal’s A Pinch of This, A Handful of That, while not fabulous in a literary sense, does have a fair number of recipes I am itching to try. I have discovered a new love for recipe books, I realise. This is very new for someone who never makes a dish the same way twice. I’ve resumed my training in full-swing and physically feel a lot better. Exercise sets a happy glow over most other things, making the limbo seem normal too. It’s good to have sleep, hunger and daily functioning back in order again. Cooking is a close second, and I’m almost there. The only other thing I’ve been doing with a fair bit of regularity is helping VC churn out foodeo after foodeo. He’s working on them at top speed and I am almost afraid I won’t be able to keep up. Here’s the next — a makeshift Aubergine Lasagne — a lazy Sunday lunch that was as much fun to put together as it was to shoot, and then sit down and eat. It was the last meal the sister and us had together before she left and some parts of this film will always remind me of the epic month we just spent together. And in honour of being stuck in the middle, and just going with the flow, this has been my track for the most part of t0day. The end of July had me heaving a sigh of relief, that August was finally here. I don’t know why I put so much pressure on myself to unwind in August. I chuckle now, but I go back read my posts from July, and immediately I know why so much depended on doing that unwinding right then. So there I was right before IFBM, glued to my computer morning and night, up to my eyeballs in spreadsheets, documents, emails and lists, cut to a few days later in August, when it was done and dusted, and all my hopes of chilling for unending spans of time with no plan in mind. August was meant to be my month off from normal programming. Empty time, with no agenda. Regrouping my work, the home, fixing things and picking up to go. If you read the last couple of posts, you’ll know it was by no means an empty time, it was time off from all things mundane, because a lot of different stuff happened, but it was also rather busy. And for the most part, I found myself with no time to sit at my computer for more than 10 minutes at a stretch. When I did, I’d find things I wanted to come back and read, blogs I’d want to delve into, people I’d want to stalk on twitter (;)) and what not. So I saved a lot of it in bookmarks to come back to. Some of it went into a folder of things to share on the blog. So here goes. I’ve been blogging for eight freaking years says Jessica Hagy — someone I love and follow. And now I found her on Medium. Its been about as long for me, and I found myself furiously nodding away at each of the points in this piece. I realise at the heart of it, every bloggers reasons for blogging really just comes down to a bunch of finite possibilities. And Jessica gets a lot of it right in this one. I wanted to write each of them on a post it and stick it up where I can see them in rotation. If you’ve been a blogger long enough, you’ll see what I mean. I was talking to someone last week about how our generation has experienced a quantum change in the growth of technology. My first television was a tiny black and white box with no sattellite TV. I got my first computer very late in life, and the Internet was an unweildy phenomenon I couldn’t quite understand. I’ve seen the days of audio cassettes, dialup Internet, burned music on CDs, using CD writers — all while still referring to the World Book Encyclopaedia to hand write my school projects. All of that happened not so long ago, and even then where we are now seems like a huge leap. Apparently we’re going to be the last generation to remember life before the Internet. I’ve been feeling a little off about my growing intolerance and my inability to stand around and give my time and attention to people and things that don’t deserve it. I’ve become super choosy about where I choose to invest myself, and some part of me wonders if I’m just turning into a cynical, unpleasant person. Just when I was beginning to consider not being the weirdo that I am, S (from The Baker in Disguise), sent me this. Apparently Meryl Streep feels like that a lot. So yes, I feel totally normal now of course haha. You’ve probably seen it already because right after I read it, I saw it pop up all over fb and twitter. If you haven’t, here it is. I have sometimes wondered about food memories that I have. And I don’t just mean strong associations or pieces of food I’ve tasted in the past. I mean thinking of something and tasting it immediately, or imagining what it might be like, or getting so fixated on tasting something specific, I am unable to rest until I make/eat it. This beautiful, beautiful piece on “imaginary food” is something I’m going to go over again and again. It brings together food, imagination, words and collective thoughts about all things delicious — fantastic. A friend recently told me about a couple that’s forcing their 9 year old daughter to diet, because they think she’s too fat. Aghast and exasperated doesn’t begin to tell you how the conversation made me feel. Ironically, I read this piece later that night. It echoes so much of what I have learned through my fitness journey — most important of which is that fitness is not an event, its a life-long choice. Which automatically means exercising to fit into a dress, (or a body type, or an image of what you think the 9 year old should look like) is futile. Not to mention problematic. You know I told you my plants are almost dead? It’s been over a year since I moved to this home and have harboured plans to garden a little bit, grow some basic herbs and veggies — get some green thumb action going. And I have not. Most of it is just lethargy, but there is also the thing about not knowing enough, not knowing where to begin or how to go about not killing everything I touch. This piece seems like a good place to begin, if you’re a newbie. So come end of monsoon, I’m going to try and do some of this in some small measure. Wish me luck! AND, and, and.. since we’re talking about cool things on the internet worth checking out, here’s our latest foodeo! VC is churning them out at the speed of light now. I am afraid I won’t be able to keep up. As we speak, two more foodeos are in edit and I’m tres excited to share them with you. But until then, make do with the one above. And listen to some music. This was playing in the supermarket some time last week — a track I was mildly obsessed (yes I was kind of into Tu Pac for a bit) with some 8-10 years ago, I was gobsmacked to hear it again, in the supermarket of all places. But old laowes have this way of haunting me from time to time. And it was on loop today. Goa was gloriously hot when I came back from Bangalore. Dull skies with these tantalisingly grey heavy clouds looming large, but no rain to speak of. Several sessions of catching up with friends over chai and cake managed to rub it in some more, just how wonderfully rainy it was for exactly those same days I was away. I had missed all the monsoon action and was experiencing severe FOMO. Its always lovely to be back in the safe, snuggly arms of my home after a trip away. Even if the trip is back to the original home — the mothership — the feeling of walking back into my own home is kind of special. I came back from Bangalore determined to slow down and pick up life where I had left off. Yes life, because it was only when I came home and looked around did I notice just how far back I had let everything “normal” slip. Eating out at an alarming frequency, my kitchen was so badly stocked. A look around the house would have given you a clue that neither I nor the hugsband had had the energy to worry about dusty corners and cobwebs. My desk was scattered with remnants of “important things” but that I had no memory of and no recollection of why they might even be important. My balcony plants were, err how do I put it, dead. The yard was (still is. I haven’t managed to get it cleaned out) overgrown, two bulbs in the staircase had fused eons ago but we just hadn’t bothered getting them fixed. So every time I entered the house post sunset, I had to scramble up in the dark. And somehow we preferred that to getting them fixed. So you get the idea. It didn’t help that I cam back from holiday with the most violent flu and throat infection I’ve had in a long long time. Its been so long since I fell sick, I forgot what my basic anti-histamine used to be. As soon as I landed in Goa, I was home bound, with a raging fever, exhaustion, blocked nose, severe cough and the works with everything in between. I gave it a few days of plain old Crocin, self-medication and home remedies, before I decided this was a mean bug and needed antibiotics. So overall it took a good long while to go away, and I wanted to be up and about before my folks landed. But I quickly learned, that the slow-down time I was fantasising about, was not to be. It was a busy month, I felt like I was on overdrive for the most part, even when I was home doing perfectly mundane things. So much happened, I tried several times to come and post here, because I had so much to say. But most of it just ended up in half written posts that fizzled out the minute it was time to get up and go shopping for groceries. Or rush to the gym. Or go away for the weekend with my folks. Or drive my sister to Siolim. Or some such. We had a fun week planned, of mostly chilling at home. Cooking out bums off, gallivanting around Panjim because they’re not into the touristy things, and mostly come here to decompress from their regular routine and spend time with us. Hot meals, shared at the dining table, with extra stools dragged in to seat us all, lingering around with laughter and chatter, long after the meal is done and our fingers had gone dry is usually the hallmark of a good holiday with the parents. We have a few stock places to go to, and I indulge my parents by letting them do the little things around my house that they like to. My mother always wants to stock up my kitchen with essentials she thinks I must have. My father wants to potter about, haul me some new plants, or get my car cleaned, or put up some more painting. My sister, stuck in the middle just goes with the flow and hangs out. It’s a different kind of family time when you host your parents, instead of the other way round. And I really love it. This time though, we took off and went away to Divar Island to spend the Independence day long weekend at a beautiful homestay, with the most wonderful family hosting us. It deserves a separate post, but it always makes my heart skip a few beats to know that I can drive out just 20 minutes, take a boat across the river and be transported to an island that is stuck in time. So close to home, and yet so far out. The boys (the hugsband and the father) rode their bikes to the island and back. It was awfully hot to be out cycling, but one can never really get between boys and their plans that involve their toys. So while my mother, sister and I reached the island refreshed and relaxed, the hugsband and my father reached there sweaty, pink and exhausted. We spent the weekend swimming in the pool, drinking cocktails, eating home cooked food, chatting with the hosts and amongst ourselves, finding out own quiet corners to escape into, hired bikes in the evening cycled around in the evening and crashed early. It was just what I needed. Home food, conversation, some reading, a pool, lots of homemade cocktails, a khau-suey meal and best of all, no cell phone coverage. Is this what a staycation is like? I could do it more often. A little rain might have made the weekend even more perfect, but I’m not complaining. The first half of August had come and gone without so much as a moment to stop and catch my breath. Every day had a plan, a new activity and I’m not sorry I was busy. I loved having my family over. The folks stayed with us for a week, and the sister was here for an extended trip until the end of the month — and as always, it makes me realise how different normal life is, as opposed to how it is when you have people staying with you. The feeling of an extended holiday showed no signs of ending. Mentally, I was in limbo. In between all of this, there was a sudden spike in H&E orders. I cracked an idea and perfected what might be the next addition on the menu — an orange and almond cake. And I baked 15 cakes in 15 days. That seems to be the way with the orders. I only every have spikes, with dull lulls in between. But the spikes always remind me how much I like to bake, just how exciting the process still feels even thought I’ve baked over a hundred cakes by now. I love figuring out new things, doing a little something differently each time, packing up the cake and sending off a happy client. My hands were full with baking, juggling a couple of skype sessions to line up some work for the next few months, and also wrapping up some IFBM commitments. So I had little time to entertain the sister as much as I usually would. She spent most of her time working on a mural in my balcony. It features, you guessed it, a haathi. But the hugsband only let it pass if it had some element of him in it too. So the haathi? He’s riding a unicycle, if you please. It fits the space in my balcony perfectly and I’m rather pleased with how it turned out. We ate out a fair bit, sampling the new Thai place, catching cocktails at a new joint in town, where I was also invited for a wine tasting the previous night. Its been a very full month as far as eating and drinking goes. I took a bit of a break form the fitness because it was just too much to keep it all going, and by the end of it, I was raring to get back and lift some weights. It was just as well that most of our day time was spent indoors (and accompanied by cool beverages :)) because the heat spiked some time last week and I was convinced the monsoon is over. It felt like summer all over again. Blue skies, patchy fluffy clouds, bright hot sun, not a rain cloud in sight. We were back to sweating our backsides off, and it might as well have been May all over again. If the skies hadn’t been so pretty, I might have been way pissed, but some part of me believed the rain wasn’t done. One look at the sky and you wouldn’t think its possible to expect more rain. October-skies were in full bloom. In August! Shiny streaks of white clouds floating by. I even sent out an exasperated prayer, asking for a light drizzle, just to feel some relief. I have this theory that when the heat spikes unnaturally high, and it reaches the unbelievable and impossible to bear point, the only way ahead is a cloudburst. And just as I had predicted, against everybody’s hopes, burst it did. And of course, it hasn’t stopped since. It went on and on for 7 days straight, I kid you not. No rest. The last 3 days of it were relentless, without even slowing down to a drizzle. Pounding rain, so bad you would have laughed if I told you it was bright, hot and sunhiney just a week ago. This isn’t normal for this time of year. The monsoon has been so scant, its worrisome. We’re not used to the late start followed by the patchy heavy spells with bright summery weather in between. This is not the Goan monsoon I know. But there’s good news, finally. Our water-table has been replenished, we’ve hit the healthy, safe mark. The paddy fields look lush and I think things are not going to be as bad as I imagined at the end of summer when the monsoon showed almost no signs of coming at all. But this pattern is scary, and I don’t know how we can begin as a community, but we need to fix this. I wonder where we can begin to make a u-turn. I had my eyes on a relaxed, slow August at the end of the crazy run-up and the event that was IFBM, but it has been anything but that. I am relaxed and at peace, but its been a full month in so many other ways. I’m looking at picking up some work, a few exciting prospects brewing, I have my eyes on finishing up a personal project before the end of the year, and I want to ramp up the H&E menu too. Almost as if by magic, this busy-ness, it suddenly feels so good. Every year, as August rolls along, this quiet but very apparent angst sets in. A restlessness that I can’t quite put a finger on, so many questions, way too many ideas, no clue where to begin or how to proceed. Behind it all is a voice, soft, but persistent. Asking questions direct and sharp. The answers to which are unformed. Mushy, nebulous. And they evade me most times. And as always, it happens in August. Something about the eighth month of the year suddenly creeping up on me, maybe? I was never very good at managing time and the sheer race of keeping up and doing so much in so little (one can never have enough time no?) is a well-established refrain in my life. I have come to accept that the number of things I want to do or am in the process of doing will always be disproportionately larger than the number of things I have done satisfactorily well. That feeling of looking back on a task well done, with that smug, satisfied grin, dusting hands off in glee – that feeling is something I have never known. This year the angst has been multiplied by the burgeoning activity I have suddenly experienced on facebook. But this year though, it’s been quickly followed up by a peaceful understanding, and acknowledgement of what is, what will be and what will never be. For the most part I watch from the sidelines, agog, as my newsfeed is tantalisingly full of food, now more than ever before. The floodgates opened after IFBM and there’s no looking back now. People engaging in link-swaps, page shares, pimping classes, props, photography, ingredients and all kinds of other goodies all the time. In the midst of the cacophony my Hungry & Excited cakes cry out feebly too. I’ve never been able to make peace with what the H&E page does for me. I bumble along because people tell me it is the way to go. I do it, but I can’t say I’m at peace with it. I have never been very good at pimping myself. I am the person who is perennially looking back on opportunities and wishing I had it in me to dive in and sell myself at the time. It’s a skill one must either have, or be willing to acquire, I have realized. Right now though, I have neither the natural ability to self-promote, nor the willingness to learn it because something about the whole act itself doesn’t come naturally and just doesn’t sit right with me. When I try, I am reminded of the one time I went all out, got out of the comfort zone and do something that didn’t come naturally but I got forced into egged on by a very head-strong and cut throat entrepreneur friend. The incident involved a stack of business cards that sat by a basket of H&E muffins, with one shoved into the hand of every hapless person to pick up a muffin for some Christmas cheer. It yielded several calls of appreciation, and one of them converted into an order. But several other things happened as a result, and the relationship with my friend (the entrepreneur has been strained ever since) and it has been one of the biggest lessons in listening to myself; and only doing something if my gut says its right. So I hang around on facebook, mostly just posting instagrammed pictures of everything I eat, everything I cook, everything I want to eat, everything I plan to cook – and many things in between. Ever since the frequency of posting a recipe has reduced, there has been even lesser action in terms of populating recipes and links on facebook. When I think about it, I feel incredibly lame cross-posting instagram pictures, because I already have instagram for it. And because I’ve a private instagram account and am an unabashed junkie, that really ought to work for me. I know I ought to be doing more on facebook, but I just cannot get myself to push through the clutter, I cannot find it in me to hit that “boost post” button, I don’t have the willingness to post every pictures, recipe link on a gazillion recipe groups, I cannot engage in comments and likes the way I see most people do. And the way they do it, I also see how fb works for them. I know its possible, but I have realised there are some things I will probably never be okay doing. I might do them in future, but never with a straight face and a comfortable stance. This is where I miss the perks of a day job. Full time employment means you don’t have to constantly sell yourself or prove yourself with every task. You’re hired for a set of skills that you’re believed to possess, and known to perform well. So the going can be as good or as great as you make it, but for the most part you just have to sit around and do what comes your way. Singularly. The responsibility of finding work, the selling work lay squarely in the lap of project managers – many of whom I worked with did the job with such astounding lack of ability, that it ought to have taught me to step in and learn a bit of it for myself. But no. I’ve said before, I’m a doer. A follower. A worker bee. And this ability to take charge, sell a product, skill or even myself, doesn’t come naturally. When I found myself doing it for IFBM, I shocked myself. Every instance of talking to a potential sponsor or a vendor and pimping the event and our desperate need to keep costs low, made me feel like I was having an out of body experience. At the end of every instance, I had to pinch myself to check if it all really happened. I surprised myself several times, sometimes pleasantly so. And it showed me that deep down, I do have the ability, I must harness it and finetune it to use it well. I remind myself that every cake I have sold this past year has happened organically, on its own without too much noise. Mostly through word-of-mouth, either in real life or online. I am yet to put an advertisement out there, or pimp an offer a discount or a scheme. It has worked so far, the question stalks me all the time — wouldn’t all this be that much higher, better, louder if I actually actively sold myself a little? The answer is yes. Of course it’s a yes. There was never a doubt about that. But my state of perennial fb-angst and observing everything I see going on fb, in these days of social proof, salability and viral quotient, makes me realize that I am old-school in this respect. When I come across articles about social media marketing, tips on how to get your blog stats to soar, how to float a business completely on facebook etc, I find myself rolling my eyes quicker than I can get through the entire piece. I have however moved from mocking it all, to watching with wonder. I realize now that there are many who make it work, and work well. I also realize why I cannot make it work. A lot of it may have to do with my stubbornness and unwillingness to self promote. But at the heart of it is a personality type. And that is something that isn’t going to change very easily, no matter how many cakes go between me and several happy clients. I’m willing to wait it out, without rushing the process by hitting “boost post”. I’m willing to wait for organic reach, even off fb. And perhaps this has everything to do with the fact that I do not depend on selling cakes to feed myself, but still. I’m willing to wait, because I believe that I may not reach out to 100 people, and sell 50 cakes a month. I may do about a tenth of that number, but the ten cakes that I deliver will be cakes I didn’t mindlessly churn out because some boosting action drove my fb stats and order scheds through the roof. They will be ten cakes going to ten people who understand the difference between fancy cake and everyday teacake. And if enough people get the taste of that, the numbers will grow and eventually, the money will follow. I call it old-school because this is what I have seen my parents believe in, and made it work. I have realized that when they told me to “find my passion and follow it uncompromisingly”, the statement unwrapped itself into a whole bunch of lifestyle choices – choices I would have to learn to slowly make. Choices that are still coming to me, slowly. Painfully. I have learned slowly but surely that it often means being happy with less and not constantly aspiring for what can be. Not letting the pursuit of money become the centre of my being and life. It means worrying less about what other people think should be my path to “success” and defining success by parameters that work for me. It often means being grateful for the little things. It means focusing on my craft, without worrying about the numbers. It’s why I struggle to call myself A Writer. I’m constantly prefixing it with trying-to-be or finding polite ways to define my niche. I don’t dare call myself a “chef” on my blog, because really WHO ARE WE KIDDING?! And I roll my eyes and chuckle every time I see something to the effect of foodie-turned-specialist on one of the million food blogs that now surround us. Every time I hear of a blogger turned author, and then read the tripe doled out in the form of a book, I resist the urge to drive a nail through my brain. It is often passed off as unnecessary modesty when I pick a veil and hide behind it, but come August every year the sinister question raises its head again – have you sold yourself enough? This year though, a quiet acceptance has turned up, in place of the restless angst that used to come with it. Have I sold myself enough? No, I haven’t sold myself at all, actually. I had grand plans to pimp a personal project at IFBM, because “it was the thing to do” and anything less would be “a waste”, I tried to do it, and the mosre unnatural it felt, the farther I felt myself moving from the project I was so supposedly so invested in. Eventually, I dropped it, and told myself things will happen, if they’re meant to. Even if it takes five years longer than if I self-promoted NOW. Recently, I read this piece of the thoughts of Werner Herzog on making a living of doing what you love, and it echoed so much of what I have seen growing up, experienced in some part, and now know is an indelible part of who I am. My grandfather was a prolific musician who silently made some of the most brilliant music for over 8 decades. He lived off meager earnings, and yet supported his wife and three children on it, and from what I hear my mother and her brothers tell us it was a fabulous childhood, that rarely allowed them to feel the pinch of what might have been missing. He won national acclaim in the form of a Sangeet Natak Akademi award when he was well past 70, but over the years won millions of hearts through his heart-rending music, passed on his thoughts about music and life to scores of students, and created a living parampara of his kind of music that will live on for hundreds of years to come. I feel humbled and grateful that I have had my grandparents and parents who have lived by this, so I don’t have to go through the hardships that they did, before I learn this way of life. They did most of the grunt work, weeded out the crap and passed on some of the best things to us – teaching us not in dogmatic, academic ways but through actions and the best example that is their own lives. Of course where I talk of baking, I could just as well replace the word “cake” with “writing” and the logic still works. What I call old-school, some may call unrealistic, idealistic. Some might even say its downright foolish. But it’s the only way I know. I haven’t done nearly as many things as I imagined I would at the start of the year, but I feel satisfied in knowing that what I did, I did without the worry of money, stats, success or adulation. The stats on my blog, the likes on the fb page, they’re just numbers. I bake because I love it. I write because I love it. And that’s pretty much all there is to it. Because like Bette Davis said, If everybody likes you, you’re pretty dull. The perpetual state of busy-ness that has been the last few months (specially the last 3-4 weeks) was frankly just terrifying at one point. I realised the limits of involvement one tends to push oneself to, when the outcome at stake is so close to ones heart. Terrifying, because it digs out levels of energy you didn’t think or know you had. It brings out skills you were convinced you didn’t have. And it shows you sides of yourself you were shocked to see. Never in my wildest dreams had I imagined I could manage a project of this scale and magnitude, from scratch. Approaching brands for sponsorship, selling ideas, spur of the moment twists and turns to pimp our platform to make it viable for them, pretending like I’m wrapping my tiny little math-confused brain around the big numbers they threw at me, being a patient and understanding face of the brand I represent, remembering to bite my tongue and learning valuable lessons in client management. Thinking on my feet has taken an all new meaning now. Of course, I can say all this with a big grin on my face, now that I have the luxury of retrospection. Its been a week and the flurry of updates, little displays of gratitude, waves of budding new friendships, incessant notifications on facebook and twitter and while personally the afterglow faded in a little over a day (because fatigue swooped in full swing), I’ve been watching the activity on facebook, with a sense of pride. It’s like growing a garden and watching things spark to life — this largely virtual community, with connections real and on-screen has suddenly sprung to life as one. 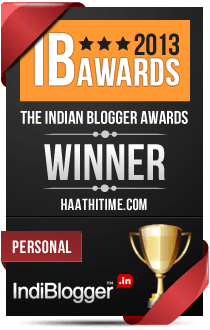 While I have been blogging here on HaathiTime for aeons now, the foodblogging stint is a more recent one for me. I usually go out of my way to stay unnoticed and have shied away from getting to know too many other food bloggers — quite a contrast to the number of friends I have made through this blog. The reasons are many, but when I started selling my baked goodies through Hungry and Excited, I had to change this. I did, only in some measure, but only when I decided to jump into organising IFBM with Aparna, Arundati and Nandita did I pull almost all the stops off. The exhilaration of putting together this thing we had only imagined and talked about for months, suddenly kicked in, the reality loomed large and kept me going. There were glitches galore, and twists and turns every step of the way, fresh googlies we didn’t plan for and never saw coming, but somehow after the initial panic, some calm brainstorming and a few measured moves later, help always seemed to come our way. Things fell into place at an alarming frequency. I was the first one amongst the four of us to check out the venue, the stunning new Aloft Bengaluru Cessna Business Park and within ten minutes of interacting with the team we had only so far exchanged emails with, I knew we couldn’t have picked a better venue. The experience at Aloft deserves a separate post. If you’ve read the last few posts from July, you’ll know I was overworked, stressed and irritable for a large part of the time. Most of it was my own doing — absurdly high expectations and standards and trying to do it all never really works, I’ve realised. I’d drift on to autopilot and just plod on like a machine, while some days I’d rave, rant and wish I had done things better. This was most evident on the night before the event as Aparna, Arundati and I sat in the hotel room, with cartons of goodies and bags strewn all over us, not a square inch left for us to walk around to even have the space to think. We somehow sorted through it, wading through the tons of gifts and goodies we had so excitedly talked about in the weeks before. In that moment, more than ever before, I told myself there was SO MUCH I had already learned form planning this event, and yet SO MUCH remained yet to be learned. Eventually though, it has all paid off. And the first ever Indian Food Bloggers Meet was nothing short of a smashing success. That feeling of satisfaction hit home the moment Arundati took the stage to begin with a round of introductions and opened session 1 on day 1. I’m still recovering form the overwhelming success that the event was. Personally, the planning and bringing together of the event taught me more than any of the sessions did because I was too busy running around even through the two days, to sit down and take in anything that was being talked about. But when we took a bow, the four of us, standing in front of 50 grinning faces, clearly euphoric over what they had experienced over the two days it hit home — IFBM turned out to be far bigger and better than I had imagined it could be. It all sinks in at the very end. Sharing the stage with Arundati, Aparna and Nandita — couldn’t have done it without them. It was nothing short of exhilarating to meet so many faces I have only known through their blogs. Discovering the people behind the words. The brains behind the pictures. The food-obsessed people I have known to love, respect and adore. Me (excuse this donkey for putting herself first), Monika, Chinmayie, Archana and Arundati — the black and yellow brigade. OOH, IFBM2014 taught me one other thing: the art of perfecting a selfie. I’m ashamed to admit I didn’t know how selfies are taken, until I was shown only approximately 50 times over the 2 day event. Excuse me while I plug in a few moments. There are far too many to choose from, and this selection is completely random. For (wayy too many) more pictures, look on the IFBM page. With Chinmayie — my “banana buddy” as I so UNgracefully called our friendship. Those who read the food blog will know why. With Monika — with whom I have never interacted with. And yet felt like we had known each other forever. With Archana. Who came close to hiring me to write for her. I don’t think she knows/remembers this! Before 1st August, the blogging community was a string of faces strewn across cyberspace. At the end of 2nd August, I came away feeling like I am a part of a community that is capable of many big things. A bunch of people that can become quite the force to contend with. With Arundati — my IFBM partner in crime, shoulder to rave and rant, sounding board, chief coordinator and idea bouncer all wrapped in one. And like a true seasonal creature the weather invokes the desire to eat these very specific things. Season-appropriate stuff that doesn’t make an appearance in my kitchen all year round. I’m talking about rain food. Like, you know, pakodas? Except I was making them in the house of a beer lover. So they’re beer battered kanda bhajias, if you will. Aided by the fact that I’ve been pottering about my kitchen again, rather than just rushing in and out as fast as I can. I’ve been spending time in there, not rejecting it like a lover who no longer holds my interest. I’m flirting with the idea of going back to life the way it was pre-summer. I’ve been cooking more than just eggs and toast. I am willing to stand by a hot stove and make it happen without feeling like the life is being gradually sucked out of me. Full meals are back again, complete with accessories like salad and raita, sabjis that are not run of the mill and slipshod, and occasionally a crunchy-munchy makes for an interesting embellishment too. And that’s how these Beer Battered Onion Rings came to be. Because it was a rainy day that just called for it. While I am really fully enjoying the outdoors in this time of monsoon — my most favourite part of this season — I’m also snuggling indoors taking full advantage of the rare opportunity to use blankets, drink lots of hot chai and sit around without a fan on. Changing seasons also change the light around my home. Where summer had me shutting all the curtains away from the blinding light, June has me turning on the lights on in the daytime, on some days. The harsh, direct, bright white light of summer makes way for a mellow, yellow-grey hue all day long. When a thick carpet of clouds floats over us, it gets gloomy and grey. I am blessed to have a large window right in front of my cooking range, so I can cook facing the window which is exactly the direction the rain lashes down on us. Cooking in the monsoon is usually cooking with a view of rain trickling down, turning the large windowpanes into pools of melding watercolour greys and greens. It was that kind of morning, last weekend when the rain was coming down in fluid streaks, and I stood by the stove pouring my morning chai into my blue mug, and something told me I needed to cook rain food. A warm, crunchy, and fit-for-the-rain snack. It had to be a fried something of course. And while heating up a load of oil in a wok is the last thing I voluntarily do, the rain calls for some ground rules to be broken. VC was only too happy. Getting Reva to cook fried stuff = achievement unlocked! I had bookmarked these Beer Battered Onion Rings I saw on Joy’s blog, because I knew it would be a welcome treat for VC who loves onion rings. The only other time they were made in this home was when he made them himself in a fit of anger; convinced that I would never, ever deep-fry anything for him. He had decided that day that if he wanted something crispy with the goodness of transfats and triglycerides, he’d have to do the deed himself. His burst of anger and the prominent streak of rebellion had made him improvise and add a South Indian twist to his onion rings — blending in come hot red chillies, curry leaves and a dash of mint into the batter. So good, that between mouthfuls of those spicy pakodas-with-a-twist, I admitted to him that they needed to be made again. Gasp! Joy’s recipe seemed like a great thing to combine with VC’s flavor combo, and I already know what the use of flour, corn flour and beer can do to anything deep-fried. It gives the word crunchy an all new meaning, adding that required lightness to the batter, creating ruffles of golden crispiness, that cling to sweet rings of onion. Of course getting VC to shoot this took absolutely zero convincing on my part. Rain, onion rings and beer – need I say more? So that’s how we made another foodeo. It seems we can’t escape the beer sneaking in, even if we try. This one may sound a little weird, but take it from me — once you try it, you’re going to want to make it again. Something about South Indian spices meeting beer battered onion rings makes it perfect for the rain. If that’s hard to digest, think of it as onion pakodas fortified with beer. Whichever way you look at it, it’s a winner. And its perfect for the monsoon. And it will perk up a boring meal. And it will make the perfect snack-for-no-reason. Don’t wait for a reason, or the right season. Make and thulp, I say. I have news: I’m done moping about the summer! The rain is here. It came with a crash, a bang and tons of rain on week one, and has petered into sporadic showers again for the last couple of days. But even so, the weather has cooled off a fair bit and life is slowly creeping back inside of me. Enthusiasm to do more than just survive, keep my head up and get through the day is inching on by the day. I’m back to cooking one, if not two meals a day. I’ve been socialising a fair bit, and we even entertained friends at home last week! Work on the Indian Food Blogger Meet has been in full swing, its keeping me on my toes, literally and figuratively. And when the day is done, I’m back to feeling like a good nights rest will do just fine, as opposed to wanting to just curl up and hope that morning never comes. I’ve also been blogging a wee bit more frequently again. The hugsband and I made three new foodeos, one of which you’ve already seen here. The second one is in edit, should be up tomorrow! And we have a third one shot and waiting to be processed. As you can see, normal programming has resumed. It started with Chocolate Souffle, but really this post is filled with louuwe for Anand’s blog. Video-loving with one of my favourite youtube playlists. In which I tell you I didn’t love Chef (the movie) but I tell you how much I love Spaghetti Aglio e Olio. Thanks to Link Love I can now justify my endless food blog-hopping and put all that trawling to good use. And now all my favourite links aren’t buried in heaps of bookmarks, but are nicely sorted and tagged on the blog. The next time I need something, I know just where to look. The other advantage has been the sudden regularity with posting on Hungry & Excited. Link Love has ensured, at least for the last three weeks, that I come back and post something at least once a week. Having a target to work at every week has made me think about what I want to share, come back and act on it. Quite unlike with the piles of unedited drafts, incomplete photo edits and unfinished blog post drafts lying around. Speaking of unfinished business, yesterday the hugsband and I took off and went to a beach restaurant early enough to catch the sunset. It was a rain-free day, there was a lovely breeze and it was too good an evening to waste sitting indoors. So we lugged our laptops along, with the express intention to finish up on forgotten work. There’s nothing like kicking back, propping your feet on a deck chair, listening to the waves crashing repeatedly, as you zone in and work. Sitting there, without even talking to each other, sipping G&Ts VC finished up the foodeo, while I literally banged out four posts, some as old as December 2013! To think, all it took to unblock about 6 months of a bloggers block was a beach, sun-set, peace and a G&T. I think I might be getting out of the procrastination rut, and maybe more frequent trips to the beach are in order. I’m going to try and keep up the tempo now and gradually post all the newly finished posts over the next few weeks. Until then there’s always Link Love. An unplanned hiatus from blogging is never easy. So when I was forced to forget about food-blogging for a while, I missed it like crazy. More so because I didn’t stop cooking. Quite contrary actually, I haven’t experienced a busier time in my kitchen. Whether it was cooking two fresh beyond-the-ordinary meals on most days, I have been trying to push the envelope for myself. And before you ask, no I wasn’t running a mini restaurant kitchen in my home, but I was trying to keep home food exciting, without losing out on a balance of veggies, meat, lentils and the rest — you know, all the good stuff and bad — in moderation. So much fodder for blogging, and no blog to say it all on. It is during this time that I learned a few things. If it were possible to have any more love and respect for the women in my family who have stellar standards in this kind of domestic godess-ness, I discovered an all new admiration for my mother, my grandmother, and some of the other leading ladies in my life. For relentlessly living the healthy life, setting such amazing examples of balanced eating and the good life. And mostly, for doing it all so casually, without making it seem like an effort or an ordeal. It’s probably where the beginnings of thinking about what I put in my belly took root. With my own mother, I know how hard it must have been to watch a career in music simmer on the back burner, while two fast-growing daughters (and we were quite the handful, in our own respective ways) and a full-fledged teaching career took up all her time. It might have been easier to give us packets of biscuits and chips in between meals, double up on the Maggi noodles and allow us to buy all the junk food we wanted to, every time we politely asked for it. The hugsband doesn’t believe it was possible, but I grew up in a home where biscuits and chips were a rare indulgence. Maggi was almost never bought. And I didn’t develop a taste for aerated drinks until much later in life because I just didn’t know what it would taste like. Even when we were allowed to buy a bar of chocolate, we’d eat a couple of pieces at a time, post a meal. To this day, I find it hard to chow down a whole bar in one go, and watch aghast when VC looks at me like I’m an alien for asking how he does it. Some may say it was a childhood deprived of the simple pleasures, but maybe our vocab is just different because even now simple food pleasures to me are things like hot dal and steamed rice. Freshly steamed beans palya. Golden parathas hot off the griddle with a smear of butter. Homemade ragi or dalia porridge for breakfast with jaggery syrup. If we wanted french fries, amma made them at home. If we wanted noodles, she’d buy an odd packet of Maggi and load it up with peas and carrots and beans. I’ve probably more than made up for my share of indulgence in junk, but I think at the core I know what a balanced diet should be, and what being healthy feels like. So after a couple of years of completely going off the rails as far as food was concerned, I was able to reign it all back in on my own without much help. I could intuitively manage my kitchen, feed myself the good stuff and bring my health and body back on track. I have the basics sorted, sometimes I slip with following through. But hey, I’m human. I’ve learned that health is a life choice that you sustain over time, not pick one fine day. The best part about this was that my parents lived every bit of this with us. They didn’t have separate rules for the kids while they ate all the junk adults are supposed to be allowed to have. We ate our meals together and talked about what we ate, where it came from and how important it was to eat what’s in our plates. It’s hard to forget lessons like that. Even though I might not have actively absorbed it all, or listened with keenness back then, I know that by osmosis, its percolated into my system. It stayed within and surfaced a few years ago when I set up my own kitchen. I look around me, people I know, friends and relatives my age and I know I am healthier than most. That health is a continuing journey to stick with, not a point at which you arrive and then let go, is a concept not many are familiar with. Even today, I’m mocked for gymming so hard even though “I don’t need it”, and I laugh inwardly rather than try and explain that it isn’t about looking thin, but feeling and staying fit. I’ve learned that I wouldn’t be able to do it all if I didn’t know better. I know the roots of this all go back to that dining table in my parents home. The one where I learnt about fresh veggies, unrefined food and whole grains. My parents talked the whole-wheat, unrefined-sugar talk long before it became a hipster cool thing to latch on to. I’ve learned that these little lessons come back and surprise me when I’m not even looking. The food I make for us at home is a lot like the food I ate growing up, and yet it is so different. But in sneaky little ways, I see how it all stems from the good beginnings I’ve had. I realise it when I look at the last four posts and see they’re all whole-wheat based preparations, even though they’re so vastly different in style. A fancy-looking braided loaf, to style up brunch. Spicy onion paranthas that just need salad or raita to turn into a full meal. Whole wheat and oatmeal breakfast muffins with unrefined sugar and no butter. Yes, its possible. A spicy palak masala loaf to mop up your favourite curry or gravy. From small and possibly uninterested beginnings at that little dining table, I’ve reached a point where I feel uncomfortable if I eat more than two meals in a row without an adequate amount of veggies. I know just how many eggs and how much meat in a week is too much for me. Heck, I’ve even managed to have a lot of this rub off on VC, who grew up in a household that is the diametric opposite of where I come from. Food-wise. And it’s these little things that have helped me chisel away at developing my own homestyle cooking, gleaning from a million different sources of inspiration, always back-tracking and checking things with Amma as I go. I couldn’t claim this is my doing, even if I tried because there will always be these little signs to point be back to where it all started. That dining table in my parents home. If you’re still here reading, thanks for sticking around and bearing with my repeated disappearances. I have an open tab next door with a half-written post, my thoughts on Bangalore, writing in peace and the summer since. A post I began typing out a week ago, but ever since I got back I’ve been on vacation mode. My editor went absconding, a friend arrived on the weekend and I have spent my days being a semi-tourist in my own city. In addition to stripping my reader down to the bare minimum and switching almost wholly to reading on the ipad, I opened up my laptop after a week today — a luxury I am planning to make a habit. But I came back to share a couple of links. Before I wrote that post about feeling a little miffed at constantly being questioned about the working of my reproductive system, hormones and my views on what I plan to do with it all, I felt incredibly alone. I hadn’t met too many women who expressed that babies are not really a priority in their lives, and everywhere I looked, nobody really shared or understood why I was so annoyed every time someone mocked, joked or made a fuss about the lack of babies in my life. Reading a Thought Catalogue article about something similar, made me feel less alone, and writing my own post even more so. But when Women’s Web decided to post it on their website, and I heard from so many women via comments on the blog and on facebook, on their page my own — I feel less isolated in feeling this way. There is a different kind of joy in connecting with strangers over very personal feelings, no? And while we’re on the topic of media loving and sharing, Hungry and Excited and Haathi were featured on here on Homegrown. Aside from some glaring, inexcusable errors (and the fact that there seems to be zilch “writing” involved on the part of the writer who wrote the piece), I was happy to be featured amongst some of the people I have read and admired. And meanwhile, here’s a few things I’ve been busy with. Those of you who are still around reading, those of you who come back to check, probably know about my food blog. And if you’ve been frequent enough, you probably remember the last food update and you know how everything’s gone quiet. The last post made an appearance over two months ago. If you’re a blogger, you’re probably also familiar with that weird feeling when you want to share a post, but don’t know where to begin. That’s where I have been for a long time. Well, actually I’m stuck between wanting to share and not knowing where to begin, and wondering if there’s any point in sharing anything at all. Because it’s been so long since that last post, and numerous rounds of apology and resolving to come back with a vengeance later, I’m getting tired of this disappearing act myself. So I can imagine what it’s like for those who return time and again with the hope that there is an update. Even more so for those who take the trouble to write in and check where I have been when I go silent for long periods of time. Those who write asking if all is well. As always, it is those calls of concern that pull me back from limbo, to tell you that things are well with me. As good as they can be, if you don’t consider the insurmountable mountain of technical glitches that have come my way. And this has primarily been the reason for my lethargy on the food blog. It’s been one thing after another for about six months now. Intermittently, I put on my red SuperWoman chaddies over my blue tights and decide I’m going to do it — monster-manic routine, lack of high-speed internet and various essential technological accessories, be damned. Sometimes I am on a roll, cooking, shooting and posting recipes with the frequency of every other trigger happy home-cook let loose on the interwebz. But then the husband decided to upgrade the OS on my laptop sometime in December, and with the zest of an OCD cleaning freak, I ended up agreeing to a system wipe. Out with the old, in with the shiny, sparkly, spanking new and all that. Which has been awesome in itself, but it meant data (a lot of yet-to-be-used photographs and unpublished drafts) being shifted on to 2 different hard disks and losing photoshop. That was the last straw. It has been like cutting off my limbs, as far as updating the food blog going goes. Not having the means, kind of means not being able to do deliver. So while I’m limping back to normalcy, ironing out one tech-glitch at a time I’ve decided that enough is enough. I still don’t have the high speed internet, am still looking for a decent cracked version of Photoshop for Mac (if you have any leads, please point them to me!) and trying to find the lost mojo to overlook all the obstacles and keep at it. But in the meantime this is to say no, the oven has not gone cold; yes, the kitchen is still a busy place. We have been cooking our exciting meals, and documenting some of them too. What’s cooking you ask? I don’t have any recipe link ups today, unfortunately. But I do have a tiny step in a new direction. It was meant to be a surprise that we were to launch with much aplomb along with a set of H&E newsletters that we’ve been working on. But the glitches on that is the stuff of a whole other blog post, and in the interest of overcoming hurdles and following through, and also because I realised it’s February already, and way too much time has passed since we began working on these, I’m back. With the red chaddies, over blue tights. With this. What started off as a fun thing to do when J was staying with us in October, turned into a mild obsession over a few days, until it was done. And eventually led to the idea of doing more videos like this. Videos about sharing the making, just as it is in our kitchen. No fuss, no nonsense. Sometimes no recipe either. In January I think, we made the second video. Completely on a whim. It resulted in us burning our battery adaptor out, from repeatedly trying to capture a Full HD video — yet another glitch that rendered me camera-less for a month and kept me from shooting anything new. And therefore from posting anything new. You see where this all ties in? This is what caused it all. So anyway, here we are. No major unveiling. No aplomb. I hope you enjoy the videos, and I hope more than anything else that this is the beginning of a lot more to come. Our vimeo channel is where you can find them all, in one place. In our next video foodeo, there will be cake. Keep your eyeballs locked for that one and in the mean time, thank you for watching these. I’d love to hear what you think! Very hungry. Very, very excited. I’m done summing up the year gone by, I’m done waxing eloquent about the one next in line, I’m done whining about the ever-present dearth of home time, and yet somehow I forgot to do the food blog link-up that I have been meaning to, only for, let’s see…the last four weeks. If you’ve been frequenting this blog for the last 6-odd months, you probably know by now that things have been erratic around here, fueled only by occasional surprise spike in enthusiasm and the return of that elusive determination to update it more often. An effort that meets all kinds of distractions along the way. Sometimes its the incorrigible need to do everything that crops up as an idea in my brain, which tends to push the normal, usual things to the back burner. Sometimes its technical difficulties, of which I’ve had plenty (burned laptop adapter, deathly slow internet, a full system wipe, brand new OS, burned camera adapter, yadayada). Sometimes it’s the discovery of something more interesting to do — like say, a book, a cooking binge, or a horrible all-consuming reality show that blocked out about 3 months in stalking a madhouse of approximately 12 utterly forgettable wannabe celebrities. Sometimes it’s the return of that incorrigible sloth, and that’s really all there is to it. I oscillate between being terribly enthusiastic and terribly lazy. In the run-up to the end of the year, I had an excuse — oh I’ll resume in earnest in January. And yet, 12 days in I’m still kind of being a big, fat lazy bum. In hindsight, I can see that this is not on. I owe you an apology. And a quick link up of all the kitchen masti that has ensued. Let’s get to it. Quickly and painlessly. The bread bug that bit me some time ago, has stayed. It caused me to do several crazy things at home, giving us a serious carb OD and huge amounts of money being spent on flour. At last count, I baked 4 kinds of bread in a particular week, the last of which was a loaf of bread to satisfy the husband’s craving for french toast. Because, you know, buying bread in a jiffy is no longer an option. It’s bonkers when I think about it, but I can’t complain. Neither can the husband. Right before my camera adapter died on me (and before I could transfer the pictures in it, on to my laptop) I baked 2-3 more kinds of bread waiting to be blogged, so consider this an IOU of sorts. Also, at the start of the year I joined the We Knead To Bake Bread-baking Group, that bakes a new bread every month. So you can expect this bread-y frenzy to persist for some months, still. It’s a loaf. And it has pudina chutney wrapped up tight inside it. Move over, pesto! I also had a caramelised-onion fetish phase, in which I was frying up onions till golden and slapping them on to everything I could. Including foccacia. I’ve reached that scary place where I make bread to use up leftover aloo sabji. If you can figure it out, let me know. The bulk of the Indian/desi-inspired khana I made is yet to be retrieved of the dead camera, but before that fiasco happened, there was this genius concoction. A pan-grilled baingan/brinjal/aubergine salad, topped with a garlic and paprika yoghurt dip. Kind of warm, kind of cold. Very yummy. And of course, there was cake. Eggless, boozy, raisin-filled carrot cupcakes for Christmas. Or after Christmas. When the various technical issues have been addressed, and my mojo creeps back to normal (it’s slowly getting there. I think) I should have a few more breads to share — a green minty loaf, something that started off being brioche but got braided into a beautiful loaf half-way, and some caramelised onion paranthas.. There is also a coffee cake in there, somewhere. And a super-spicy South-Indian horse-gram curry. There’s also some talk of introducing 3 new cakes to the H&E menu. I have them in my head, I need to get cracking and perfect the recipes, get my guinea pigs to sample and approve/disapprove so I can decide to keep or change them. Then there’s a bread-y venture I am about to get into, but you will hear more on that when I have figured out some logistics. For far too long, I have been trying to figure out delivering some drier stuff (cookies, mainly) to other cities, and this too needs some attention at the earliest. There’s a series of newsletters I have started and stopped writing several times over, that I absolutely must finish and send out because they include the introduction of something VC and I are very, very excited to share. So before I go ahead and blurt it out, let me stop. For the first time in a long time, the excited might be outdoing the hungry, in these parts. But its a sign of good times. Happy times. It’s wonderful to have all these plans. But I’ve had them simmering away for far too long now. I just need to get cracking cooking, plate up and dish them out already.